Cold Pursuit is a quirky and dark comedy movie and one that is not necessarily what you might expect when you sit down to watch it. We entered the film having seen the trailer on several occasions and were expecting a film that was quirky and light. I wasn't keen to see another 'Liam Neeson brutally takes on the world' movie, but the trailer had me thinking that this would not be the usual Neeson movie of the past few years. However, 20 minutes into the film, I was actually considering leaving, as I found the film to be very dark and slow moving, and not at all what I expected. The plot felt disjointed and there was little to no humour to juxtapose the violence. I did not leave my seat, however, and I'm glad I didn't because this is a film that slowly invites you in, inch by inch. Whether or not you choose to get on board or not, that is up to you. The film slowly edges a number of puzzle pieces closer together, until eventually, a picture starts to form. Once it did, I was certainly on board. 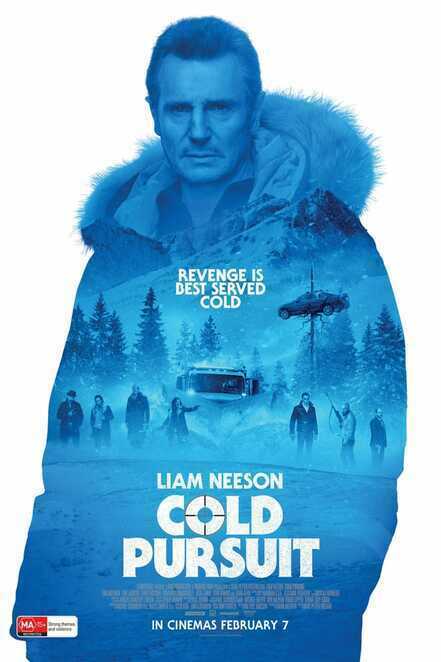 Neeson plays Nels Coxman, a man living a quiet life in a harsh weathered part of Kehoe, where he works as a snowplow driver. Coxman is a quiet man, much to the frustration of his wife (Laura Dern). When their son is murdered by a drug cartel, Coxman begins to look for answers and eventually ends up taking the law into his own hands. The film also introduces a third group to the conflict, a Native American drug cartel, which adds more depth and scope to the puzzle. The film is directed by Norwegian director Hans Petter Moland, in his first Hollywood movie. Moland uses title cards to commemorate each characters death, and of course, as the film goes on, the cards get quite plentiful. Combined with all the nicknames for each character, this aspect of the film was very funny. Tom Bateman plays the drug lord Trevor "Viking" Calcote. Early in the film, Calcote seemed like a very ordinary villain, with Bateman being quite irritating to watch. However, as the film progresses, his character really grows on you to be a very good villain by the end. The film has a lot of small moments, small characters, and quirky ideas, all of which need, and are given time to breathe. By the end, you can't help but feel you really enjoyed the experience of watching it all. The filming within the icy lands is well done, giving the film a great focus on the characters, whilst allowing the film to easily throw a surprise WTF moment at you (such as the final moment of the film). Cold Pursuit won't agree with everybody, but it's certainly worth a look.